We have been camping for a very long time. For the last seven years we have been going to events as merchants. One of the biggest challenges is cooking meals while running a shop. So how do we get good, home cooked meals without spending a lot of time cooking at war? We cook at home. Today’s blog is about the ultimate cheat. Canning cookies. Now that may sound totally wacky, but it actually works beautifully. We had the idea several years ago when we cooked for a Medieval feast and produced a ridiculous number of extra cookies, called Shrewsbury Cakes. The original recipe, from “A Delightful Daily Exercise for Ladies and Gentlewomen, by John Murrell (1617), states “you may keep them halfe a yeare but new baked are best.” Well, OK. So if they were keeping them for a long time “back then”, we should be able to do the same thing today. Going back to our general knowledge of food and food storage, we were aware that oxygen, heat, bacteria, and bugs are the biggest dangers for most food storage. We own a vacuum sealer that we use for freezing the veggies from our garden. 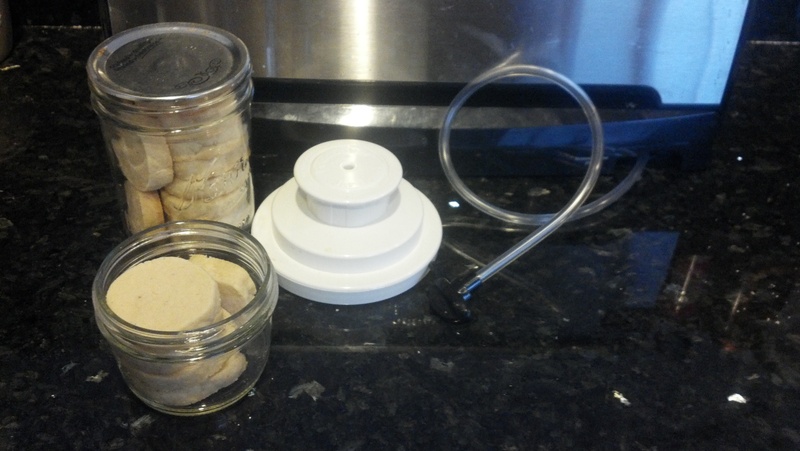 The sealer comes with a special attachment that allows you to vacuum wide-mouth canning jars. The jars keep the cookies from being crushed and they keep the cookies fresh. This picture shows my basic set-up – ready to go! First you need the wide mouth canning jars. They MUST be large mouth unless your vacuum sealer has an attachment that will allow you to vacuum other sizes. The jars must be clean AND COMPLETELY DRY. You do NOT want to add moisture into the cookies. Place your canning jar lids in a pot of hot water. I usually put my pan on simmer and when it starts to bubble I turn it off. The water keeps the lids hot until I need the lids. This heat softens the built in gasket on the lids and allows them to seal securely to the jars. Pack the cookies carefully into the jars, being sure that they do not stick up above the top edge of the jar. Make sure that there are NO crumbs on the top edge of the jar – crumbs will prevent the jar lid from sealing correctly. Pick up a hot jar lid (I have a special lid lifter with a magnet on the end that allows me to avoid burning my fingers), dry the inside of the lid CAREFULLY with a CLEAN paper towel and put the lid on the top of the jar. Place the vacuum sealer attachment on the jar, attach the vacuum line, and follow the instructions for your machine to vacuum seal the jar. 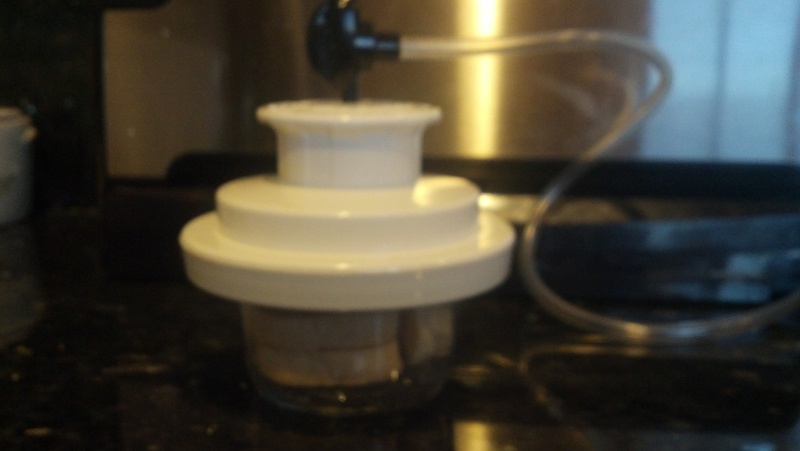 Here is a picture of my vacuum machine in action. When you are done, the jar lid should be “stuck” in place on the jar. Put a twist band onto the jar to keep the jar lid in place, and label. I actually don’t know how long cookies will last when canned. Mine have never lasted more than six months, because we ate them. Shrewsbury cakes are actually a type of shortbread, which is a VERY stable type of cookie, but I have also canned oatmeal raisin and chocolate chip cookies. Experiment with your own recipes to see what works best for you. Drier cookies, generally work better than high moisture cookies. 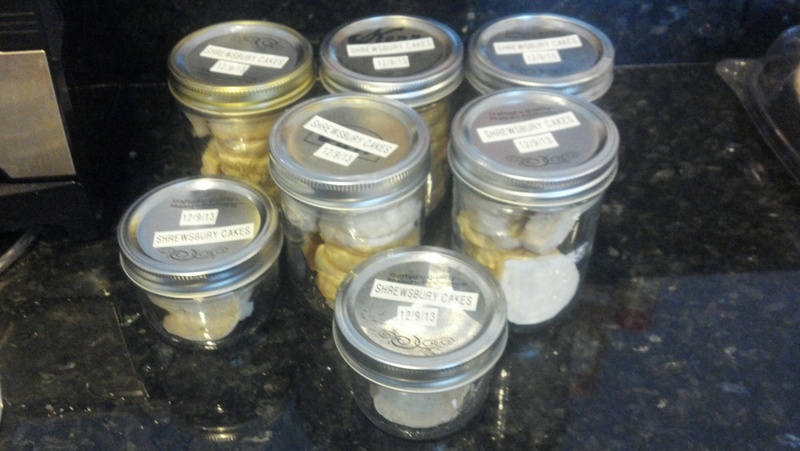 DO NOT store your jars in the sun – this will cause moisture to come out of the cookies and promote spoilage. I hope that this blog gives you some ideas about how you can have better quality food for camping events, or even just keep cookies “in stock” at home.